This stunning 0.60 Carat t.w. 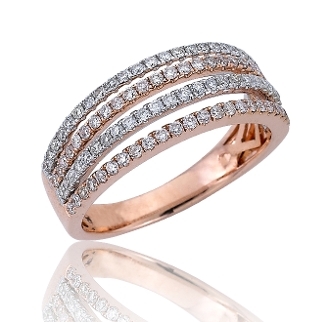 Quad Pave Diamond Split Row Ring is made of alternating solid 14 Karat rose & white gold. Each row shimmers with pave set brilliant round Diamonds. This ring is a spectacular way to show the special woman in your life just how much the years together have meant to you. This anniversary give her a gift that will remind her of the day you married her for years to come. For added appeal personalize your item, select our Engrave option and indicate size needed when adding to Cart. Approximate Dimensions: The width of the ring at the top is 7.1mm and narrows towards the sides to 5.4mm. The thickness (height) at the top of the ring is 3.6mm. The polished shank measures 2.7mm at the bottom.